"No one from the Muslim Brotherhood will be there; not even the Brotherhood Youth and we are not responsible for anyone who speaks in our name (illegitimately)," said leading Muslim Brotherhood (MB) figure Sobhi Saleh. According to Saleh, the MB decided to disregard calls for a massive demonstration planned for today in Tahrir Square for two reasons: a lack of clarity and the confusion of objectives. Firstly, as Saleh told Ahram Online in an exclusive interview Thursday evening, "It is not really clear who is actually calling for this demonstration; we are not sure and there are so many groups and sub-groups that it has become very difficult to identify who is making the call." Saleh, added, that he isn't even certain that the 25 January Revolution Coalition (JRC) or the Campaign to support Mohamed ElBaradei for President, are calling for the demonstration. The JRC, he argued, has not made a direct and clear call for the demonstration and "we have good relations with Dr ElBaradei, and if it were he who was calling for the demonstration, he would have told us because we have a direct channel of communications". Moreover, according to Saleh, the MB – the largest and most influential Islamist group in Egypt – believes that it doesn't make much sense to call for a second revolution when "the first revolution has not fulfilled all its objectives." "The demands of the 25 January Revolution are not yet accomplished. The revolution called for the regime to be toppled and we have only decapitated the regime which is still operating through a wide apparatus especially the local councils that we insist should be dissolved," Saleh said. Saleh also wants to see a complete overhaul of the newly established National Security body which he asserts is "the same" as the recently dissolved State Security. Reshuffling the leadership and amending the modus operandi of state TV as well as removing the university deans appointed by ousted president Hosni Mubarak's regime are also on the list of objectives that Saleh believes deserve more work and attention than the call for a new revolution – the basis of the call for today's demonstrations according to the MB figure. The MB figure argues that "work is already underway to achieve these objectives" through legal and political channels: "We are working to get a court order to dissolve the local councils and we are garnering the support of many political forces to demand the implementation of the required changes." Saleh also stated that the MB is working through the channel of "well-conceived" activism whereby public pressure is applied to secure the fulfilment of the right demand while not engaging in uncalled for confrontations. Meanwhile, Saleh commended the decision of the currently ruling Supreme Council for Armed Forces (SCAF) to refrain from securing the demonstration as "very wise". In view of the obscurity surrounding the call for the demonstration and the participation, Saleh finds it more prudent for SCAF to steer clear of confusion's way. "Otherwise it would get stuck in" the middle of a very uncertain situation. Indeed, the MB and SCAF "share an agreement", according to Saleh, on the clear and legitimate objectives of the 25 January Revolution "and we exchange views and consult if any side is concerned over something – so why run into a collision course with the army". 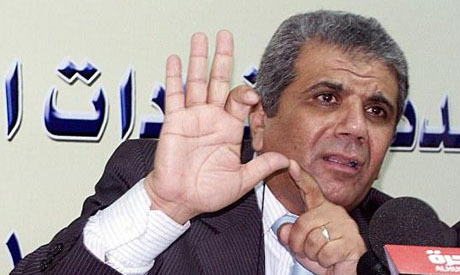 He adds, "I don’t really understand the point of the complaints made by some against the head of SCAF". The armed forces and SCAF, emphasises Saleh, "took a historic and glorious decision when they decided to protect the revolution". Today, he adds, the time has come for them to step back so as "to keep the wise separation between the army and politics because one is not good for the other". The way forward as the MB insists "is to honour the national consensus that was reflected in the [March] referendum on the constitutional amendments" and to proceed towards parliamentary elections in September followed by the drafting of a new constitution and eventually presidential elections. Anything short of this or inconsistent with this, he adds, would be "strictly unconstitutional" and the MB would oppose it firmly. Saleh, a member of the limited and largely Islamist committee that drafted the amendments, shot down any concerns over the planned September parliamentary elections, especially those related to the overriding fear of the Islamisation of Egypt. The objective of the MB is one of "reform and reconstruction" whereby there is no room for discrimination against Copts who, he argues, are not subject to any discrimination in the first place. The leading MB figure has recently come under wide attack for overtly dismissing the political affiliations of liberal, socialist and other Muslims who pursue any course other than that of Islamic Sharia. He later had to withdraw his statements which were perceived as prejudicial and biased against fellow Muslims whose reading of Islam differs from the one held by the Brotherhood. "It is not really clear who is actually calling for this demonstration; we are not sure and there are so many groups and sub-groups that it has become very difficult to identify who is making the call." is a very strong argument. In politics as in life sometimes less is more! the so called liberals ie secularists are just scared of anything islamic. if they come to power, they too will behave like mubarak by oppressing the muslims under the pretext of 'fighting terrorism'. even before in power, they are behaving like a group of thugs by trYing to deny the voiCe of over 77% egyptians who want the election to be held in september. their logic is simple... we are the intelligent and educated ones while the other 77% egyptians are stupid uneducated rural folks who have been fooled by the MB.